Google Glass has been on the lips of many professionals over the course of the last couple of years, but it hasn’t really broken out to the public just yet. We had rumors of mid to late 2013 launches and then ‘sometime in 2014’, but nothing has ever been concrete. Are Samsung about to step-up and beat Google to the market? I must say it’s going to be close call as both companies are looking at 2014 launches, but it is Samsung that have been more precise with a launch date. After launching their Galaxy Gear in 2013 the South Korean giants are now gunning to unveil their very own computing eye-wear by the name of Galaxy Glass. Samsung have announced a date for Galaxy Glass but you will have to wait a few months yet, the good news is that they are looking at 2014 though and have chosen September (usually the Apple iPhone launch month). Whether this is an attempt to try and put a spanner in the works of Apple’s annual event, I wouldn’t bet against it, but with Apple rumors looking at a June launch they might have got one over on their bitter rivals. 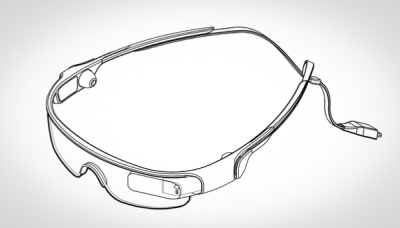 What Will Galaxy Glass Do? Just like Google Glass this device will sit on your face like a pair of sunglasses or glasses. The device will link up to your Smartphone and then you will see notifications, music playback info, calls, navigation and other important information right before your eyes. Samsung just can’t keep out of the news, it was only yesterday we reported on the patent licensing agreement with Google, and they are always reaching out to innovate new types of devices. This type of technology is still very gimmicky, and probably won’t make a profit for a long time. However, with that said there is a lot of potential behind this type of gadget and who knows where it will lead to in years to come.